On Tuesday, Febuary 5, Rev. 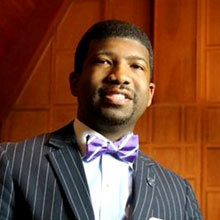 C. Edward “CJ” Rhodes II will present the keynote address at the Black History Month Kickoff event. The UM Gospel Choir will perform for the kickoff at noon at the Student Union Lobby. The son of famed civil rights attorney Carroll Rhodes Sr., he is the youngest pastor of Mount Helm Baptist Church, the capital city’s oldest historically black congregation. Prior to graduating from the University of Mississippi with a B.A. in philosophy, Rhodes worked closely with the William Winter Institute for Racial Reconciliation. He continued his education at Duke Divinity School, where he served as vice president of the Black Seminarians Union in Raleigh, N.C.
Now ordained, Rhodes serves on the boards of the Urban League of Greater Jackson, Center for Ministry and Mississippi Religious Leadership Conference, and is former president of the Farish Street/Main Street Project. The recipient of numerous awards and recognitions, he also serves as host of “The CJ Rhodes Show” on WRBJ 97.7 FM and is the author of Thy Kingdom Come: Reflections on Pastoral and Prophetic Ministry. For a comprehensive list of events, contact the Office of the Dean of Students, 422 Union, call 662-915-7247 or 662-915-7248, or email Valeria Ross at vross@olemiss.edu.